What comes to your mind when you hear ‘Udaipur’? I know what came to our minds the first time we heard about it. We figured that this would be a place full of Rajasthan’s culture, covered with yellow buildings. We assumed that we would see women in ghagra and men in dhoti wandering around. In short, after watching so many movies portraying Udaipur, we imagined a typical Rajasthani city to greet us. A city where Rajasthani folks sing their songs and perform the Ghoomar dance. So, we were completely unprepared for what we saw. Udaipur is not at all like the place shown in movies. Sure, it does offer you Rajasthani culture to look at but it is much more than that. This peaceful city, surrounded by the Aravalli ranges, is one of the most picturesque city you can ever be to. With its numerous lakes and palaces, it is different from all the places you have been so far. This is why it should definitely have a spot on your bucket list. Spend a week here and gorge on their delicious food and explore the beautiful palaces around. Udaipur is often called the Venice of the East and if you visit here then you would know that this actually holds true. This small Rajasthani city was previously the capital of the Mewar Kingdom and was founded in 1559 by Maharaja Udai Singh II. 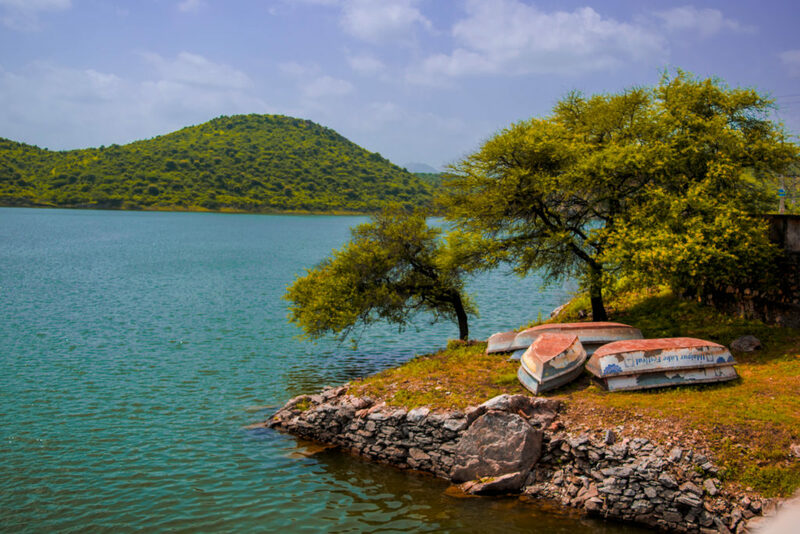 It is a small city but is surrounded by the beautiful Aravalli mountain ranges and artificial lakes which makes it a popular weekend getaway from Delhi. And the best part about this city is that you don’t have to travel far to reach a place. Most of the major attractions are located nearby which makes exploring this city easy and quick. In Udaipur, you will learn about the lavish royal lifestyle by heading to the City Palace, Jal Mahal, and so on. So, if you are looking for a short break in a peaceful city while indulging in the Rajasthani culture. And would like to taste some delicacies then Udaipur City is the perfect destination. Similar to Jaipur, Udaipur is a popular destination in Rajasthani so it is well-connected to other North Indian cities like Delhi, Jaipur, Ahmedabad, etc. and a few places from the South and Central India as well. You have three modes of transportation to reach the Udaipur City: Air, Train, and Road. Maharana Pratap Airport is the main airport for the Udaipur City which is located in Dabok, 22km away from the Udaipur City. You will get regular flights to this airport from other major cities like Delhi, Jaipur, Mumbai, etc. From the airport, you can hire taxis, cabs, or autos to reach the Udaipur City which will take about 30-35 minutes of travel time. Udaipur City is well-connected to most of India via the Railway lines which includes Delhi, Kolkata, Ahmedabad, Mumbai, Jaipur, Ajmer, and so on. In Rajasthan, you will find several passenger trains as well running daily which will connect Udaipur to other cities in Rajasthan. From the train station, you can take an auto or an Uber to your hostel/hotel. You can also walk to your accommodation place if 3-4 km is not a big deal for you. From Delhi, there are only 2-3 direct trains to Udaipur so plan in advance your trip to the Udaipur City. A Sleeper coach in the Delhi to Udaipur City train will cost about 380 – 400 INR but make sure you book it in advance. I, personally, reached Jaipur first and then took a Second Sitting (2S) from Jaipur to Udaipur which cost me about 175 INR and took 6-7 hours to reach. You will also find regular buses available to the Udaipur City from major cities like Delhi, Indore, Jaipur, Kota, etc. From local to private buses, you will get a lot of options to choose from depending on your budget. With the Rajasthan State Road Transport Corporation, you will also get buses to cities like Jodhpur, Chittorgarh, Bhilwara, and so on. A.C Private buses from Delhi to Udaipur will cost you between 900 to 2000 INR and will take around 12 – 14 hours to reach. Since Udaipur City is small, you don’t have too many transportation options here as most of the places are at walkable distance. However, if you don’t wish to walk the entire day then here are a few ways to explore the Udaipur City. One of the major modes of transportation in the Udaipur City are auto-rickshaws which charge 75 – 100 INR for a 2-3 km distance. You will find auto-rickshaws at all the junctions and streets. But you would need to bargain a lot to get them to lower the prices. If you have Ola app installed then you can Ola Autos here too. Apart from the Autos, you have had an extensive network of Uber cabs here which cover most of the corners. The prices are decent but a lot of streets are one-way in Udaipur so they might drop you before your destination. One of the best ways to explore the Udaipur City is by walking or hiring a cycle. You can hire a cycle for a day for 100 – 200 INR and can easily cover most of the attractions here. But if you don’t mind walking then you can easily walk to the City Palace, Fatehpur Lake, Ambrai Ghat, etc. Since Udaipur City is surrounded by the Aravalli mountain ranges, this place remains cool most of the year. So, you can plan a trip to Udaipur whenever you wish. 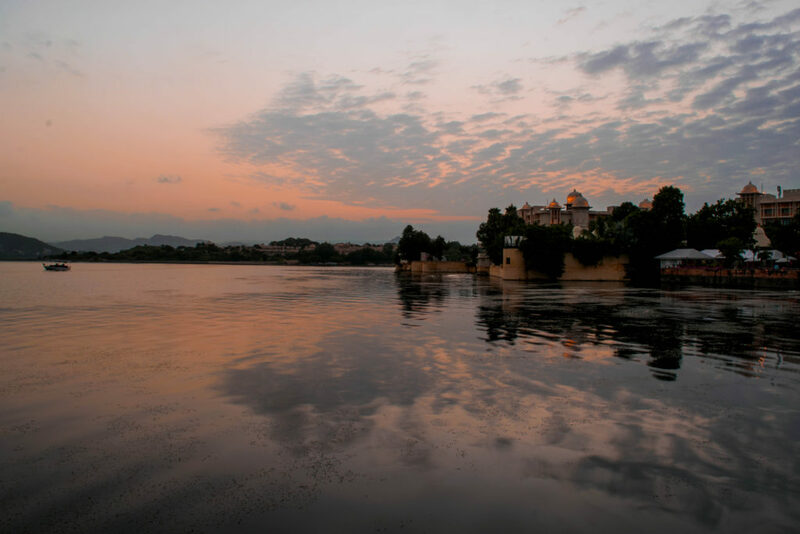 Here is a detailed breakup of what to expect in Udaipur during different climates. One of the best time to visit Udaipur if you are looking for a cool climate is the winter months from November to February. During this time, it is easier to stay out and explore the city. You will also be able to enjoy the lakes here at this time and will be able to spend more time in the palace complexes. Although Udaipur City experiences little rainfall, it doesn’t hinder your trip and can actually be a boon in disguise. This is because the water level in the lakes rises and you can witness the freshness of this city properly. The colors are more vibrant during this time and the temperature is still bearable. The monsoon months are from July to September in Udaipur. This is probably the worst time to visit the Udaipur City because the temperature is high and the lakes are all dried up. So, avoid visiting Udaipur from April to June as you won’t be able to truly enjoy it. Udaipur City is smaller than most Rajasthani cities and towns but still has a lot to offer in terms of views and sightseeing. Here are a few places that you can check out on your short trip to this cultural city. Situated on the banks of Lake Pichhola, City Palace is one of the most beautiful places to visit in the Udaipur City. Constructed by Maharana Udai Mirza Singh in 1559, it boasts of a beautiful combination of architecture styles (European, Chinese, and Medieval). This palace has 11 palace complexes inside, built by different rulers at different time periods. So, you have several courtyards, terraces, hanging gardens, etc. to explore in this giant mansion. It also offers you a gorgeous view of the Udaipur lake and the Udaipur lake Palace on one side of the palace. And you can see the entire Udaipur city from the other side of the palace which makes it a great spot for panoramic views as well. Opening Timings: 9:30 a.m. to 5:30 p.m. Located in the heart of the Udaipur City, Gangaur Ghat is a prime location for watching sunsets or just hanging out with your friends. Here, you will observe the locals going about their work and the photography enthusiasts crowding this place during the morning time. This is one of the main ghats of Udaipur City and gets extremely crowded during festivals like Ganesh Chaturthi, Navarathri, and so on. So, if you want to see a beautiful sunrise or sunset then Gangaur Ghat should be the place to visit. One of the less explored places in the Udaipur City, Ambrai Ghat is the perfect destination for evening strolls and night photography enthusiasts. 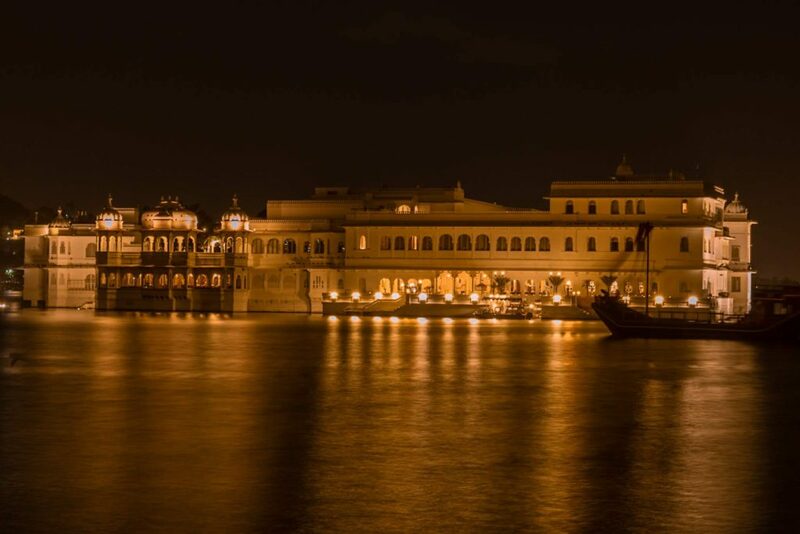 From here, you can see the entire Lake Pichhola in its complete glory along with the beautifully lit up City Palace, Jag Mandir, Jal Palace, and so on. 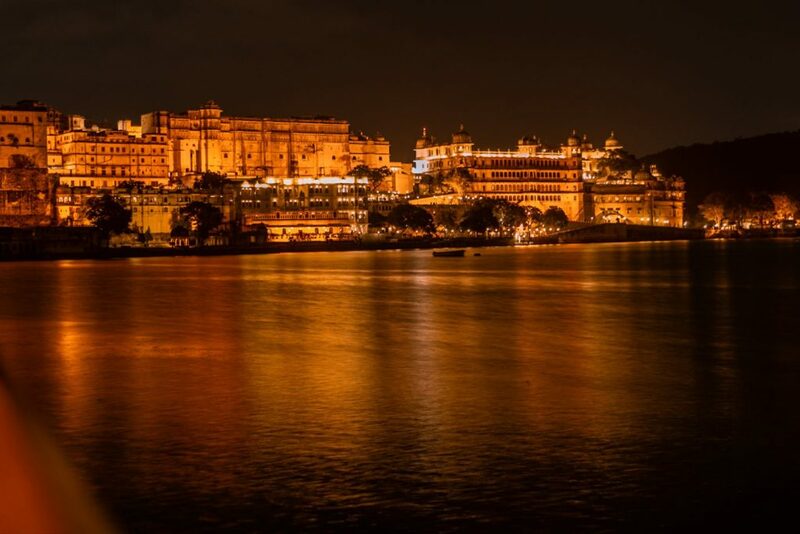 You definitely have to visit this place at the night time if you want to see the true beauty of Udaipur and you can also enjoy a delicious meal in one of the lakeside restaurants here. Fateh Sagar Lake is a gorgeous place to visit on your Udaipur trip where you can enjoy a nice and peaceful evening stroll and eat on the numerous stalls lined next to the lake. This place can be called the Marine Drive of Udaipur where you can enjoy a short ride beside the lake or you can just sit down to experience the cool, soft breeze blowing here. You can also take a ferry and cross the lake to reach the Udaipur Nehru Park, which is a beautiful place to stroll around and spend some time under the trees shade. This is a perfect picnic spot in Udaipur and spend a couple of hours, surrounded by the lake. Opening Hours: 9:30 a.m. to 7:00 p.m. This small island in the middle of Lake Pichhola is quite popular for its amazing interior design and royal architecture style. Also, the view of the lake from this temple island is quite mesmerizing and the detailed sculptures on the marble make it truly an artistic marvel. You can take a calm and peaceful boat ride to this place to enjoy the views and immerse yourself in the serene and peaceful vibes which are emanated by this place. Opening Hours: 9:00 a.m. to 7:00 p.m.
One of the most royal and romantic resorts in India, Lake Palace was previously known as Jag Niwas but now has been taken over by the Taj group. It has become one of the most sought-after resort now and should certainly be in your itinerary if you are interested in Udaipur’s heritage and monuments. It consists of several islands, on one of which lies the famous lake palace, and is situated on the famous Lake Pichhola which makes the views from this palace even more enchanting. You can take a boat ride to this lake palace to enjoy the view and then head back to the city so that you don’t have to pay an exorbitant amount to stay at this resort. Opening Hours: 10:00 a.m. to 6:00 p.m.
Also known as the Monsoon Palace, this ancient fort lies on the outskirts of Udaipur and is situated some 12 km away from the Udaipur City Palace. Surrounded by Aravalli ranges, this is a paradise for all those people who wish to just observe the green Aravalli ranges and enjoy the strong winds blowing through this palace. 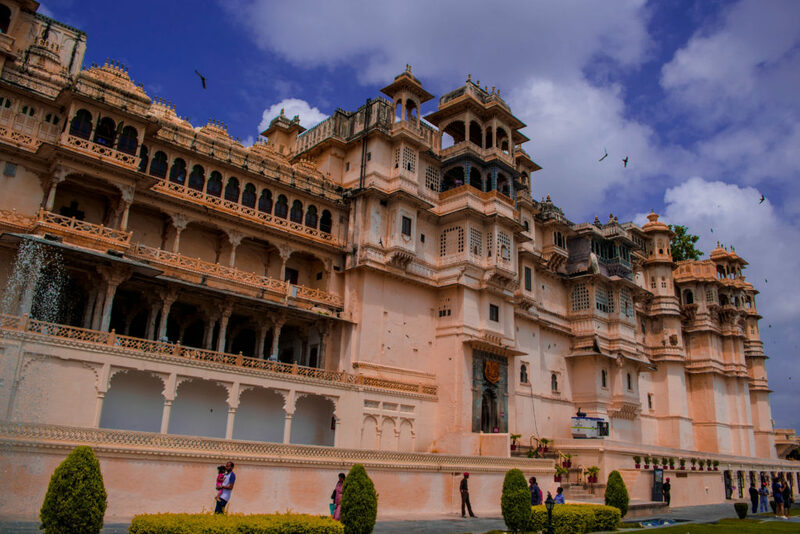 This palace also provides you with a panoramic view of the Udaipur city, its palaces, and lakes and trust us, you would do better to not miss this absolutely gorgeous place. Opening Hours: 8:00 a.m. to 6:00 p.m.
Another less explored yet amazing place to visit in the Udaipur City is the Ahar Cenotaphs which is located next to the Ahar Museum. This place contains around 250 cenotaphs of the Mewar rajas which were built over 350 years approximately. This is definitely a great spot for photography and one can spend an hour or two here quite easily. However, if you are looking to do a proper photography session here, then you need to pay the guard 50 INR per person to get access. You can also check out the Ahar museum here to learn more about the royalties who lived here. Opening Hours: 9:00 a.m to 5:00 p.m.
Udaipur City is popularly known as the City of Lakes so it is no surprise that there are some gorgeous lakes here which you have to visit when exploring the city. One such pristine lake is the Lake Badi which is situated 12 km away from the Udaipur City, in the Badi village. This artificial lake was built by Maharana Raj Singh I in 1963 to help the people of Udaipur City during a devastating drought. It is one of the finest freshwater lakes in India and is a great place to relax and rejuvenate yourself. Trust me, this is one of the few places that should definitely be on your Udaipur itinerary. Shilpgram is the Arts and Craft village in the Udaipur City where you can learn about the Rajasthan culture and lifestyle. If you love purchasing traditional arts and crafts or if you like indulging in the local traditions then you would love Shilpgram. Here, you can observe the Rajasthani customs and be entertained by the scheduled dance performances that occur almost daily here. Explore the entire village and look at different huts displaying various Rajasthani items while depicting the lifestyle of Rajasthan. Opening Hours: 11:00 a.m. to 7:00 p.m.
Lake Pichhola is one of the main lakes of the Udaipur City which was named after a nearby village, Picholi. This lake is home to a few islands which holds a few famous monuments and palaces of the Mewar dynasty. Also, the gorgeous Aravalli mountain ranges offer an amazing backdrop to this lake and make it a sight to behold. There are a couple of ferries which go to and fro on this lake. They will take you to the Jagmandir island to visit the famous Jag Mandir temple over there or to the Taj Lake Palace for exploring the monuments. You can also spend some time on the Jaal Boraj Road. It lies between the Pichhola lake and the Dudh Talai lake and provides you with an unobstructed view of the lighted Jag Mandir temple at night. The streets get empty early at night around 11 p.m and there are only a few shops open. This makes it perfect for a night stroll to witness the silence and the beauty of this calm, peaceful city. Chand Pole Puliya is a narrow bridge which connects the Udaipur city over the underlying Lake Pichhola. Take a stroll through this bridge at night because the whole of Udaipur is lighted up at night. And I swear the view from the bridge is too beautiful and indescribable. In fact, the bridges are lighted up at night too. So if you are at Chand Pole Puliya, you are likely to see the other bridge lighted with lamps and bulbs. And the light is reflected on the flowing lake water offering you with a mesmerizing view. Another place that you should not miss out on is the Manshapurna Karni Mata Temple which is only accessible by the ropeway. This temple is located on the Machla Magra hills, near Doodh Talai and offers the most amazing view of the entire Udaipur City. You can also enjoy a beautiful sunset view from here along with a beautiful reflection on Lake Pichhola. Opening Hours: 9:00 a.m. to 9:00 p.m. If you wish to explore other parts of Rajasthan as well, read this India backpacking itinerary. Fateh Sagar Lake is one of the best places to stroll around in the evening or at nighttime. You can watch the water moving smoothly in the lake or you can just hang out with your friends and enjoy each other’s company. Trust me, walking around this lake is really peaceful, especially in the evening. And is a great way to enjoy your surroundings and have deep conversations with your friends and family. 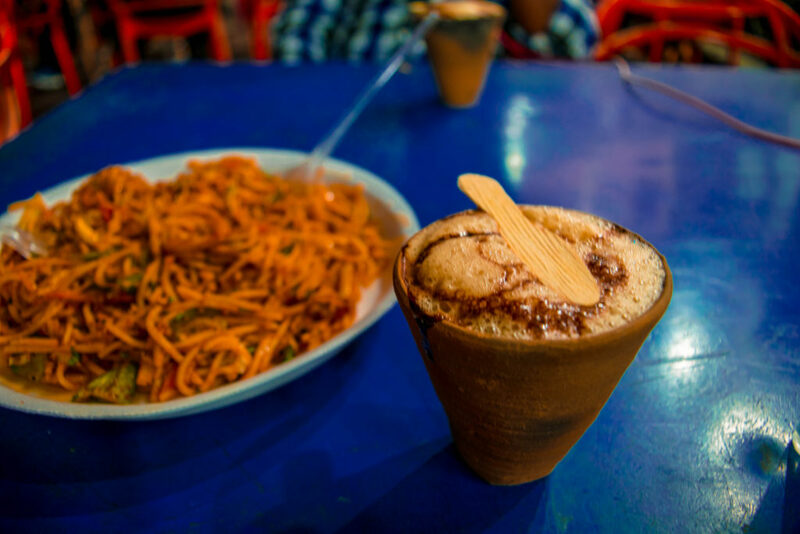 Lying next to the Fateh Sagar Lake, you have the Bambaii Bazaar which is quite famous for its delicacies and the authentic Kulhad Coffee. So, you can enjoy snacks like Pav Bhaji, Chowmein, etc. along with a kulhad of coffee which has chocolate sauce in it. I am not exaggerating but a visit to Udaipur City without trying the famous Kulhad Coffee is a trip incomplete. Another popular activity to do in Udaipur City is to visit the Karni Mata temple via ropeway. Here, you can enjoy the beautiful view in front of you. You can see Lake Pichhola along with the Aravalli mountain ranges while traveling in the ropeway which is, in turn, an amazing experience. 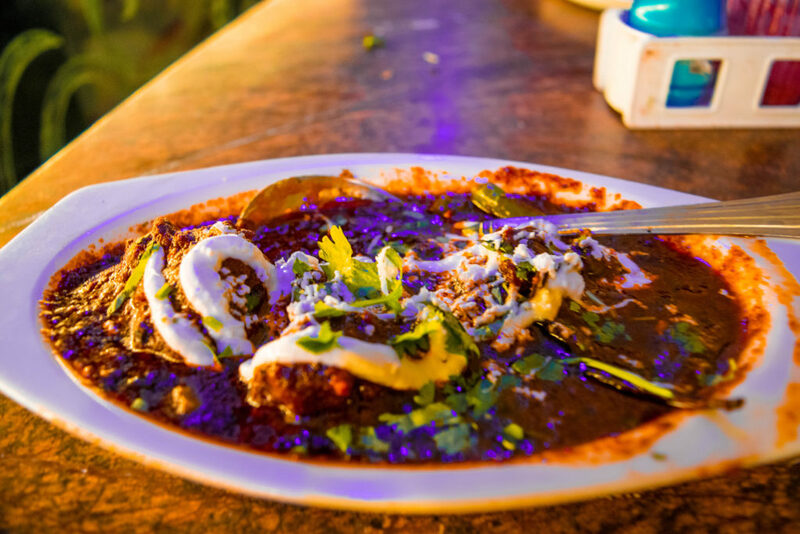 For all the non-vegetarians out there, Laal Maas is a must-try dish in the Udaipur City. It is a popular delicacy here of Mutton and is quite delicious and unique. So, make sure you eat it in a lakeside for a delicious food with a view. Hathi Pol Bazaar is quite famous for a shopping spree and offers you a range of clothing, accessories, etc. to choose from. You will find really colorful items here but your bargaining skills should be top-notch if you don’t want to end up spending a fortune here. One of the top places to watch a sunset in the Udaipur City is the Monsoon Palace which gives you an unobstructed view of the sunset. So, if you visit on a clear and sunny day then you can see the most gorgeous sunset from the balcony of this palace. And the Aravalli mountain ranges offer a magical backdrop to this sunset, making it a perfect Instagram-worthy sunset to capture. 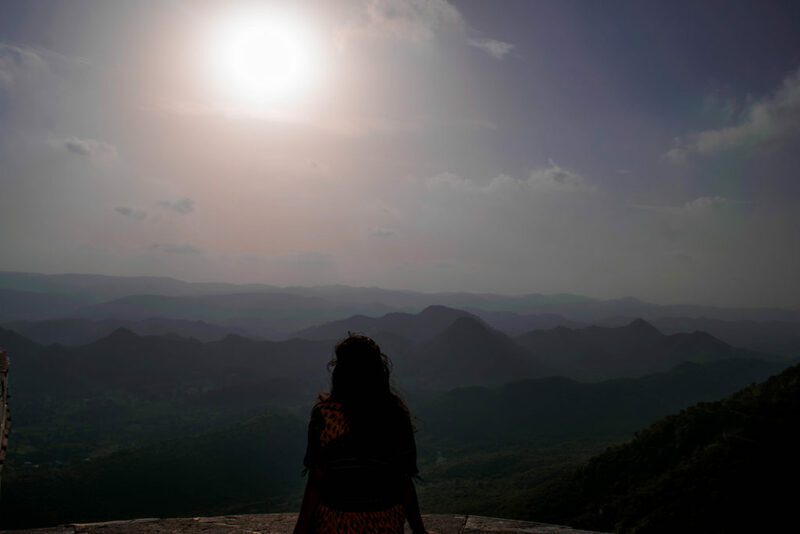 If you could not witness the sunset from Sajjangarh fort due to some reason, don’t be disheartened. Udaipur has its own Sunset Point in place for you to visit and enjoy the last rays of the setting sun while looking over the Udaipur lake and enjoying the pleasant breeze flowing around you. After taking a ropeway to the Karni Mata Temple, you will find a tower from where you can witness a gorgeous sunset. You can also see the entire Udaipur City along with Lake Pichhola, Jag Mandir, etc. from this sunset point too. As I mentioned before, if you want to take night shots of the beautifully lit City Palace, Taj Lake Palace, Jag Mandir, etc. then Ambrai Ghat is the perfect place. Just head to this place in the evening and watch the sun setting down and then the entire Udaipur City getting lit up with colorful lights. Trust me, it is one of the most magical sights ever and you would be a fool to miss it. Okay, it doesn’t have to be a romantic meal with someone, you can enjoy some solitude here on a solo trip too. But, having dinner beside the lake is a must for a complete Udaipur City feeling. Unless you experience it, you won’t be able to see why people called Udaipur the Venice of the East. I have been to Udaipur City twice but it was only on my second visit that I was able to explore the Badi Lake which I am glad that I did. This lake is situated a little away from the city which makes it peaceful and beautiful to explore. You won’t hear a sound here and can easily spend a couple of hours just looking at the mountains and the surrounding lake water. I am a foodie but I am not a person who believes in going to expensive or fancy hotels/resorts. 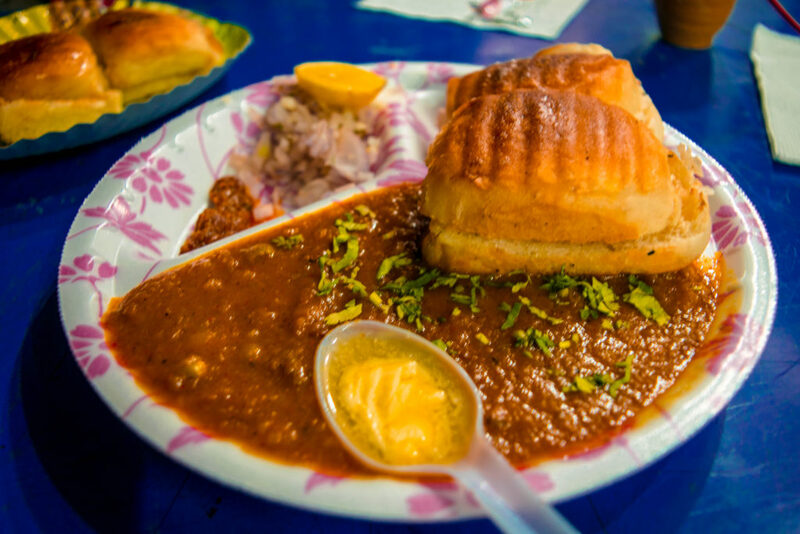 So, here are a few places which I tried in the Udaipur City for budget meals which were delicious at the same time. Natraj Restaurant is one of the oldest eateries in Udaipur City and is certainly one of the best too. You get the most delicious Daal Baati Churma here. But if you are craving some other cuisines, then you will get that here too. They make particularly nice north Indian meals and have decent pricing. So, a meal for two people will cost about 400 – 500 INR. Note: This is a purely vegetarian restaurant. For people who crave non-vegetarian, Al Rehmaniya Lake View Restaurant is a good choice. Here, you get the most delicious Laal Maas and also get a variety of chicken and other meat dishes. A meal for two will cost about 300 – 400 INR for two people and will be quite filling. This is probably one of the cheapest eateries in the Udaipur City and serves the most delicious Pav Bhajis ever. You will also get a delicious Kulhad Coffee here and can try other snacks here like sandwiches, chowmein, dosa, and so on. A meal for two people will cost about 200 – 250 INR here. Note: Once you are done with your meals, make sure you try the Kulfi here. There are many Kulfi stalls available throughout Udaipur. It will cost just 20 INR per person and will be mouth-watering. Udaipur city is a popular traveling destination so you will find several hostels, hotels, and resorts for your accommodation. Here are a few accommodation options to consider for yourself. There are several hostels here that you can consider like Hostelavie, Hostel Moustache, Zostel, Gostops, etc. 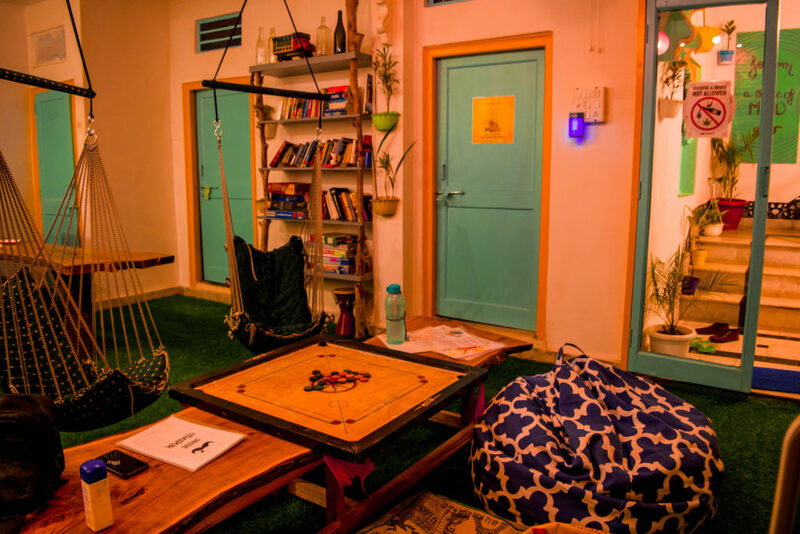 Most of these hostels will offer you a bed in the range of 100 – 600 INR for a night. It will include all the bathroom amenities, WiFi, entertainment options, etc. So, you can check on Booking.com or Goibibo.com for the best options and reserve your place in these hostels. Apart from the hostels, you also have some beautiful hotels and resorts here like the Oberoi Udaivilas, Taj Lake Palace, etc. But these resorts will be quite expensive. So, if you are on a budget then booking in these hotels might not be a wise idea. You can check mid-ranged hotels like Treebo, Baghol Palace, Mewargarh Palace, and so on. They will cost you about 1000 – 2500 INR for two people for a 2-night stay. Again, you can check the Booking.com to find the cheapest rates for your stay here. I visited Udaipur last month and all the lakes are amazing. I enjoyed the sunset from Pichola lake and it was truly amazing.